Ugaadi is also known as Samvatsaradi by the Telugu people. It is one of the most important festivals of Andhra Pradesh / Telangana and Karnataka. 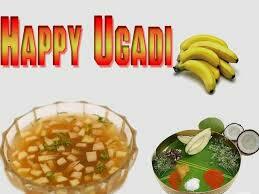 Ugadi is the New Year's day for the Telugu and Kannada people. The day marks the beginning of a New Year as per the Hindu calendar. The new year begins with the Hindu month Chaitram. Chaitra Amavasya (i.e the day of moonless night) is known as Kotha Amavasya in some regions of Andhra Pradesh. The next day after Chaitra Amavasya i.e the padyami day is celebrated as Ugadi. The festival mostly falls in the month of March / April of the Gregorian calendar. According to the estimations of some astrologers, it is said that Lord Sri Krishna left the physical world to reach His Heavenly Abode on the wee hours of this day. Hence, Ugadi day marks the end of Dwapara Yuga and the beginning of Kaliyuga. However, there is no historical evidences on the same. In Telugu calendar, each year is given a specific name. Altogether there are names of 60 years and these names are said to be associated with Brahma Manasa Putria i.e Sage Narada. The name of the 61st year is a repetition of the name of the 1st year. Hence the 60 names of the years keep repeating in cycles. The same day is celebrated with different names in different regions of the country. In Karnataka, it is celebrated as Yugaadi, in Maharashtra it is celebrated as Gudi Padwa (Parva means fesitval). The festival of Ugaadi has more social significance than religious significance. The day marks the beginning of the pleasant spring season in the Northern Hemisphere with the melodious song Kokila bird spreading in the atmosphere, the tender mangoes and healthy fresh fragrance of the neem flovers all around. However, in the recent past due to global warming and green house effect, all the freshness and pleasantness are gradually disappearing and most of the Southern states in India experience summer season during this time. As the festival marks the beginning of a New Year, the Telugu people celebrate the festival with much fervor. However, there is a belief that it is on this i.e on Chaitra Suddha Padyami day (suddha is a term used to signify the brighter half of the moon) Lord Brahma initiated His work of creation. Keeping the present days global warming aside, Ugadi which is celebrated in the spring season when Mother Nature is at her best with all the plants and trees with fresh new leaves and colorful flowers all around, brings fresh and new hopes in the people who leave their past behind. As this day is the beginning of a New Year, its celebration is important for the Telugu people who make heavy purchases and purchase new clothes for all the family members. The women folk / home-makers involve themselves in decorating the main entrance door of their homes with mamidi toranam or mango leaves and flowers. They also draw floral designs or traditional muggulu on the floor and prepare a special recipe called Ugaadi Pachchadi only on this special day. People in some traditional families apply nuvvulu nune (sesame oil) on their body, take bath with nalugu pindi (powder made of a combination of pulses) and then shampoo their hair with kunkudu kaayalu (reetha extract - English name: Sapindus). Then they wear new dress compulsorily on this auspicious day and it is customary to take the special recipe as the first food of the day after performing the daily worship to God. . Most of the Telugu people with a religious bent of mind compulsorily visit the nearby temples to worship the God and seek His blessings on the New Year's day. And what to mention of the special dishes prepared for lunch on this day. Most of the families prepare traditional dishes like poornam burelu, dahi vada and pulihora in addition to other popular Andhra delicacies. Ugadi is a festival of family gathering when the family members enjoy delicious traditional recipes, get themselves involved in family fun activities, laughter, entertainment thus spreading happiness and positive vibes all around. In addition to all these enjoyments the most important activity done on this day after worship is Panchanga Pathanam (reading of the new calender) and Panchanga Sravanam (listening). Being the New Year day, the new calender of the year is read by the scholars while the same is listened by the people. In almost all the local temples, the temple priests read the kota panchangam (new calender) to the audience. These days, the same is being aired in almost all the local Telugu TV channels. In addition to these celebrations several organizations conduct various cultural programs like Kavi Sammelana, Ugaadi Puraskaralu - awards ceremony - and the like in order to revive, encourage and bring awareness among the public on the rich culture of Andhra Pradesh, the Telugu literature and poetry works. This is a special recipe made only on the Ugaadi day with the arrival of new raw mangoes which is the main ingredient of the recipe. This pachchadi is a special combination of shad ruchulu (six different tastes) viz. bitter, sweet, sour, salt, spicy and tangy. In fact the six tastes of the recipe signify that life is a combination of various feelings like happiness, sad, anger, fear etc. Besides this belief, it a healthy combination of all the tastes which is considered good for health. Take one medium green raw mango, peel off the skin, cut it into very small pieces and keep aside. Take equal measures of (one small cup) of newly made jaggery, tamarind juice extracted from new crop of tamarind. Take these in a container and keep stirring till the jaggery gets dissolved in the tamarind juice. Now add the finely cut raw mango pieces to this mixture. Add little salt, red chilli powder or even black pepper powder to the mixture. Now add the main ingredients that is the white flowers of neem tree. Add few flowers only as adding too many flowers will turn the pachchadi bitter. Besides these main ingredients, you can even add dry fruits like cashew nuts, raisins, almonds and pieces of fresh fruits like banana, grapes, apple and many more as per your wish. Thus the celebrations of Ugaadi are much enjoyed by the people of Andhra Pradesh when friends and relatives make visits to each other's house and exchange Ugaadi pachchadi. Date of Ugaadi: April 6, 2019 (Saturday) - Sri Vikari Nama Samvatsaram. Happy Ugaadi to all the readers!